What happens when you gather 150 gentlemen on bicycle at Savile Row? 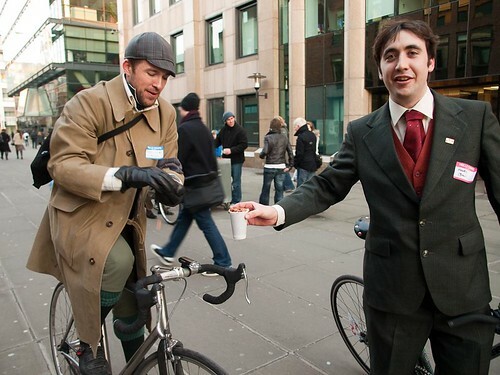 You get the first ever Tweed Run as the cyclists dressed in merino, tweed, flat caps and ties. Prizes included most dashing dame, most dapper chap and best mustache. All photos Some Rights Reserved by Matt S in London. With apologies to MarkJ for more of this bicycle frivolity. You do the sustainability movement well. What a great idea! A girls' only reaction is to swoon! Our fine British brethren are such an inspiration! In likeness of their excellent cap wearing cyclery, San Francisco aficionados of bicycles, bow ties, and herringbone will be having their very own Thursday Tweed Ride on February the 12th! Thanks for that Colin -- I'll promote that to a link probably tomorrow or the next day. SF has beaten us to the punch! But we congratulate them on their pluck. We too have been greatly inspired by London's Tweed Run. And so we of the BBC will be hosting Chicago's 1st Annual Queen's Tweed Ride on Saturday, 2 May 2009. The auspicious date marks the 40th anniversary of the RMS Queen Elizabeth II's maiden voyage to the colonies. For more info is here!